Following an effective sales process is paramount when it comes to making sales and increasing revenues in any business. Much of a salesperson’s success is natural ability, but proper sales training is also a big part of the picture. Sales training helps the sales process in several different areas. Making a favorable first impression is crucial in any type of sales. A good first impression helps set the tone for the rest of the interaction and can have an influence on whether a sale is made or not. Proper training will teach salespeople how to approach prospective customers in the most effective way to create the impression you want. During any sales interaction, the salesperson wants the prospect to feel as though he has a solution to his problem. This is usually accomplished by outlining the benefits that your product or service provides. Since different companies sell different products and services and have different target markets, effective sales training is important to present those benefits the way management wants them presented. The way that benefits are presented to a sporting goods store owner will differ quite a bit from how they’re presented to the manager of a software company. It’s always good to maintain your own personality throughout the sales process. Maintaining positive relationships with prospects has a lot to do with natural ability, but the training will keep the process moving along. The close is one area where many salespeople slip up, and it’s the one area where you can’t afford to slip up and still get the sale. Closing is a skill that can be taught, and should be taught during the training process. Through training, you’ll learn how to ask for the sale, when to ask for the sale, and how to react when you inevitably encounter resistance. Once you start building on your closing skills, you will see your sales totals climb steadily and you will definitely reach new heights in your sales career. If the sales team works in a retail environment, uniformity and presenting a united front at all times is important. It won’t help the overall sales totals if different sales people use drastically different styles or approaches when they’re all selling the same items under the same roof. Sales training will help to get everyone on the same page, so that all customers get the same basic experience. Every great business was built upon great leadership. Some great leaders are born and some are created along the way, and even though each one has his own unique style, they all share some common characteristics. A great leader must be able to communicate well with all members of the organization. It’s important that he says what he means and gets his message across clearly at all times. Clear communication leaves no doubt in an employees mind about what’s expected, and makes the whole process run more smoothly. A great leader will demand accountability from themselves and everyone beneath them. They will ask questions and hold those accountable who were responsible for any oversights or failures. Accountability may come off as being too tough at times, but it is necessary if the business is to grow and succeed. Respect for oneself and for everyone else is an essential part of being a great leader. Employees can sense if their manager doesn’t have any self-respect, and if that’s the case they won’t show him any either. Likewise, if employees aren’t treated with respect, they won’t respond to a manager’s requests. All leaders have vision, no matter what arena they practice in. Having vision means seeing beyond what’s right in front of you and having a clear set of goals to follow. The true visionary just moves onto a new set of goals once the first ones are reached, always maintaining focus on the end goal. A great leader wasn’t born a great leader, and in all likelihood it took a great deal of persistence to get in that position. Great leaders are dedicated and they don’t quit. When obstacles get in the way, they look for a solution and they continue to trudge onward until they have accomplished their goals. Leaders have to make decisions. Sometimes they have to make hundreds of decisions everyday. In business, there are times when action must be taken immediately or opportunities are missed. A great leader is able to make decisions quickly and confidently, and even though they may not always be the right decisions, the good of the organization is always top of mind. Even though some people think that certain qualities supercede others when it comes to great leadership, it’s important to keep them all in balance. Great leaders are able to find a balance among all of the different leadership qualities, so they are all strong and they all work together to get the job done on a consistent basis. Presentations are a part of doing business in many different industries, and having presentation skills is important to make each one a success. Many people have natural abilities when it comes to presenting, but more often than not, presentation skills training is required to make sure everyone is on the same page. Presenting is a skill like anything else, and it’s a skill that can be learned and improved through proper training. There are usually a handful of reasons why someone should go through presentation skills training. Someone who is in sales and is involved in persuading high-end prospects to buy products or services would do well with presentation skills training. The art of persuasion requires a delicate touch at times, and it is often during the presentation where a sales rep makes or breaks the deal. Properly orchestrated, a sales presentation designed to persuade will attract attention, pique curiosity and guide the prospect through each phase of the process, so he basically has no choice but to buy when the presentation is over. Obviously, sales are a crucial part of any organization, so it pays to train the people responsible for bringing them in as thoroughly as possible. If you are in a management position, and you are in charge of getting your employees to accept a major change, presentation skills training would certainly be an asset. 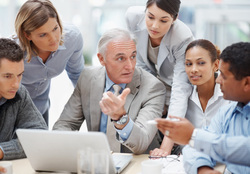 Anyone who has been a manager know how tough it can be to get all of the employees on board when a policy change or new initiative has been sent down ‘from above’. Strong presentation skills will help to get everyone’s attention and guide them over to your way of thinking. An effective presentation will remove many of the objection and doubts from the employee’s minds and enable the manager to save the day. 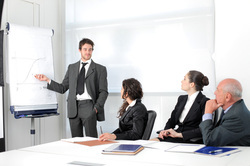 Basically, anyone who must speak to groups of three people or greater would benefit from presentation skills training. This may include sales reps, it may include managers, and it may also include teachers, coaches, executives, business owners or politicians. Any situation where you must present information to a group would do well with training. First impressions mean a lot, and if you aren’t adequately trained, you could lose your audience before you even really get going. And once you lose the attention of the audience, you’ve likely lost your chance to get your point or your message across, whatever it happened to be. Presentation skills training offers a lot of benefits, but not being properly trained may have even more of an impact. If you aren’t trained well, but still need to make presentations you may be leaving money on the table every time you present. You also might end up missing out on a job opportunity or promotion to someone who doesn’t have your skills, but can handle himself in front of an audience. Take the time to look through your business or organization and identify every team member who would benefit from presentation skills training. In the end, the whole organization will be better off.